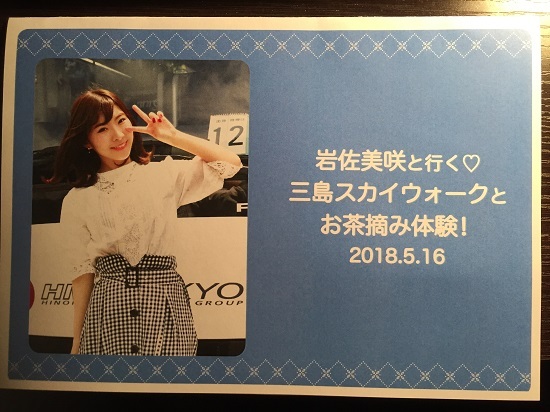 Iwasa Misaki 7th Single Chara-Ani Cheki Event at Tokuma/Nippon Crown Headquarters (2018/06/16) Plus, a Special Gift from Wasamin! 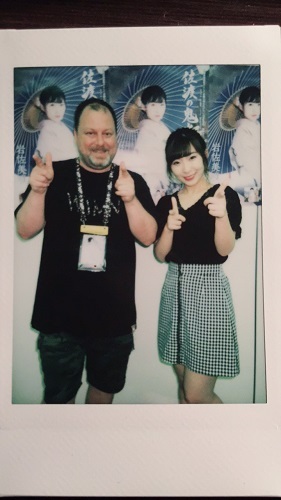 While most everyone was busy with the Sousenkyo, I got busy with Wasamin’s 2-shot event. But first, look what I received in the mail! This is a really nice touch provided by the fan club. 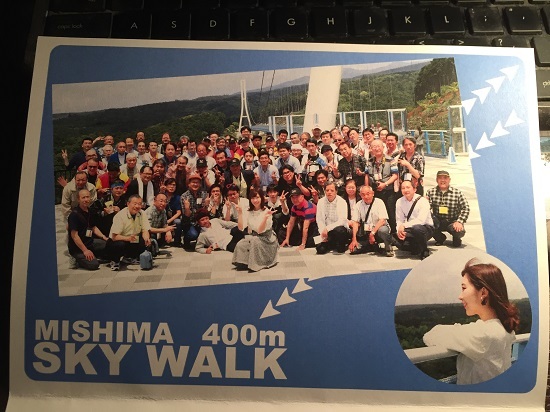 I am always excited when I see an envelope in my mailbox with the Wasa-Min fan club logo. Wasamin has started a new blog on Ameblo, which will replace her LINE blog. Let’s see if she posts here more often than she did on LINE. Anyway, on to the main subject of the post…. 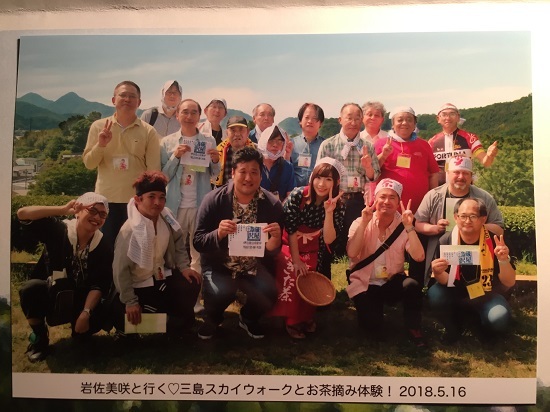 This was the second of two events of this type she had scheduled in support of Sado no Ondeko. The first one clashed with the HKT48 Shamekai event, so I was only able to make it to the last of the three slots. This time I had tickets for all three slots of the event, so I was ready for the full experience. It was the usual setup. The anonymous record label building located somewhere between Osaki and Gotanda Stations. We are basically confined to two rooms on the third floor. The room with the queue, and then the other room with the queue directly to Wasamin. When I arrived, some of the fans thought I would be at Sousenkyo. I replied “What’s a Sousenkyo?” LOL. BTW, I arrived with 3 tickets, but ultimately ended up taking five chekis. Here are the pics, and a little bit of commentary for each one. For some reason this particular handshake is sort of a blur for me. Perhaps because I hadn’t eaten all day. But I think we were discussing her new blog. I was telling her that although I could read her LINE Blog. I always got an error when I tried to comment. She asked me if I am able to comment on Ameblo, which I can. (Although I will need to figure out my password, I haven’t used it in a while) Oh, and before I left I purchased two more tickets, one each for Slots 2 and 3. After that I was off to lunch. Just as I walked into the room with Misaki, she was having a bit of trouble with her costume. 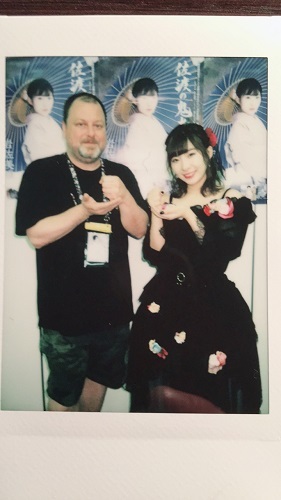 So Ichikawa-san was adjusting it for her. 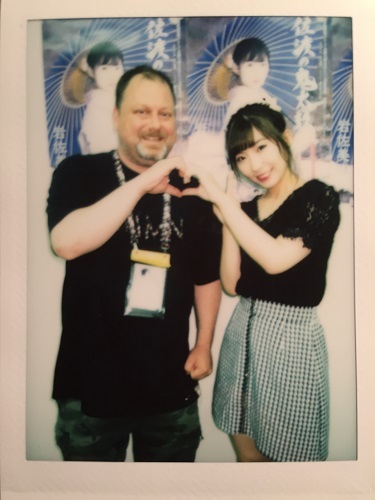 I turned my head and exclaimed “Wasamin abunai” She didn’t notice at first, but Sasou-san, who was taking photos, was laughing. 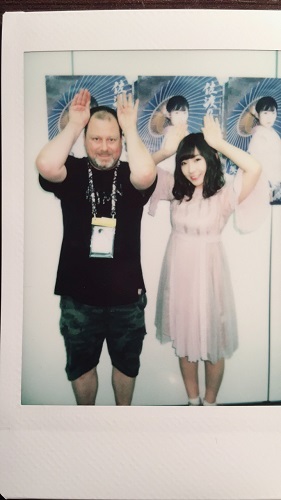 Eventually Wasamin saw what I was doing. 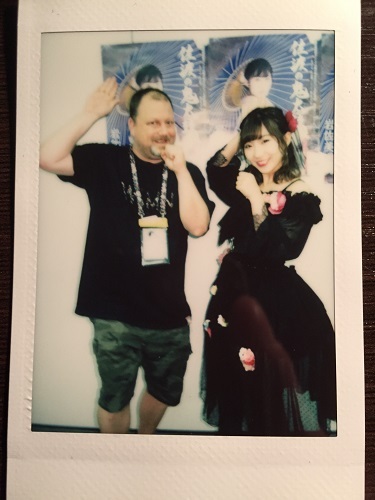 She asked me what pose, and I asked her if there was a pose for “UFO.” (The Pink Lady song) She kept laughing at the way I was saying it. (like “oooh-fou”) and kept replying “It’s yoo-fou” I said in America it’s U-F-O, which she said she knew. Anyway, that’s the pose we came up with. She sang that song at Ebisu in this outfit, which is why I came up with it. 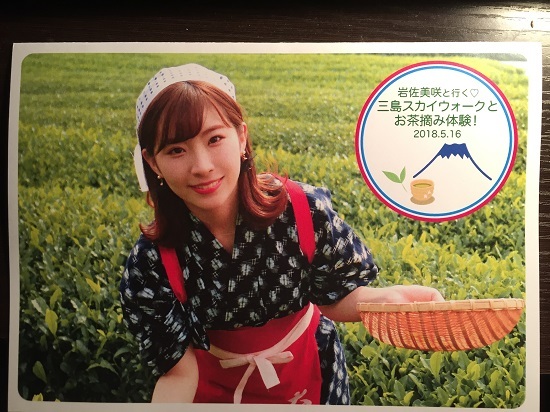 I told her I received my photo package from the bus tour, and that the picture of her in the tea outfit is really cute. I suggested some sort of “tea pose” and this is what we came up with. The classic “heart pose” When I walked in I said that I recognized the outfit she was wearing, but I couldn’t remember where I saw her wearing it. It must have been on Twitter, or Showroom. Afterwards I showed her that I had my ticket for tomorrow’s concert in Yokohama. So she said “Okay, see you tomorrow.” But I have one more ticket! For the final pic I thought the infamous Dandy Sakano “Gets” pose would look good. And actually, I kinda like the way it came out. 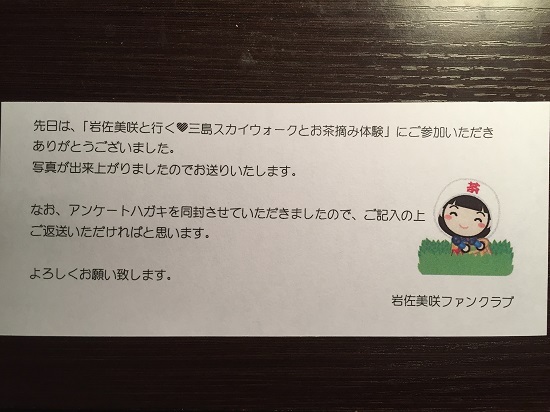 Before I left I was telling Wasamin (and Ichikawa-san) that I was reading the “Thank You” not she sent with the Bus Tour Photos, and that I noticed the Keigo in the letter, which I explained is what I am currently learning in Japanese. I gave her some examples of what I remembered off the top of my head. She said she was really happy my Japanese was improving. I told her I am doing my best. And with that I was done. If I went straight home, I would have been back in time for the SSK announcements. However, I decided to do a little shopping instead, so I got home sometime around the Undergirls announcements. 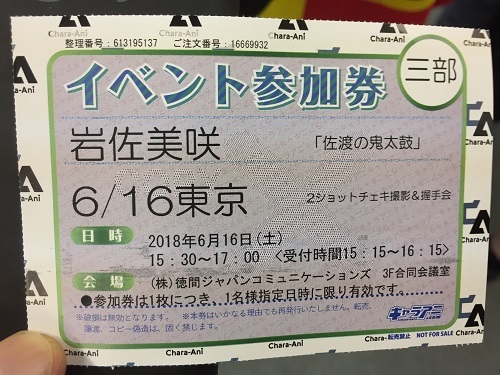 Tomorrow I will be heading out to Yokohama for both Wasamin and Minyo Girls’ concerts at the DMM VR Theater. I have no idea how this is going to work since I have never seen a concert done with “Virtual Reality.” But the preview Wasamin tweeted looked interesting. Anyway, I am looking forward to it.